Every writer has its incredible and unparalleled style. This original way of writing distinguishes every author, thus basing on it every researcher can find out the way the author reveals own ideas. The poetry analysis is a way to show the direction of writer’s thoughts and check a unique writing style. This is quite a complex academic assignment, thus if you have no time to complete it, better order a paper online using services of reliable online writing company. Poetry analysis is the paper that reveals the main elements of the poem, including functional, artistic, and structural pieces. The poetry analysis has the same structure as a literary analysis essay. This analysis brings a strong need to check the choices made by the author and the consequences. This is the exact assignment where an in-depth analysis is requested. In order to complete a poetry analysis essay, it is important to read poetry first. You need to check every piece of the poetry, thus it is preferable to reread it a few times at least. You can make as many notes as needed. This will help you to include every slightest detail into your essay paper. Make sure to check the type of poem, rhyme scheme, and other used poetic techniques. This short poem contains five lines. The rhymed are the first, second and fifth lines, together with rhymed third and fourth lines of a poem. This is a special type of poem with fourteen lines, which has become famous after Shakespeare poems were revealed to the world. The poem is inscribed in iambic pentameter. This poem has a total number of ten lines with eight lines in an iambic trimester. The additional lines are of iambic pentameter. This poem invented by Japanese has three lines and seventeen syllables. The poem’s syllable count is 5/7/5. Free Verse. This type of poetry has no regular rhythm or does not rhyme at all. When completing a poem analysis essay, it is important to check what type of poem you are dealing with, because various types differ by a structure. Once dealing with the technical aspects, structural pieces, it is high time to start checking the poem’s background. The background analysis includes the analysis of the cultural context of the poem, the time it was written, etc. Writing a poetry analysis essay requires proper knowledge of the type of the analyzed poem, the writer’s unique style, the cultural context, and the time the poem was written. It is important to determine the tone, theme, mode, and the meaning of the poem when preparing an essay paper. Different writers have different ideas about the main reasons why the author wrote a poem, its meaning and influence on people, thus it is easy to find completely different points of view regarding the same poem. In the same time, it gives more possibilities for readers to find the one point of view their own opinions suits the most. However, every analysis must be supported by evidence and various theories. The paper must include critical thinking elements, even if you provide multiple ideas and theories. Your own ideas and theories will make the essay paper unique, which is extremely important for a high final grade. When dealing with various opinions, choose the one that is the most validated, and supported by numerous facts, analysis results, and evidence. 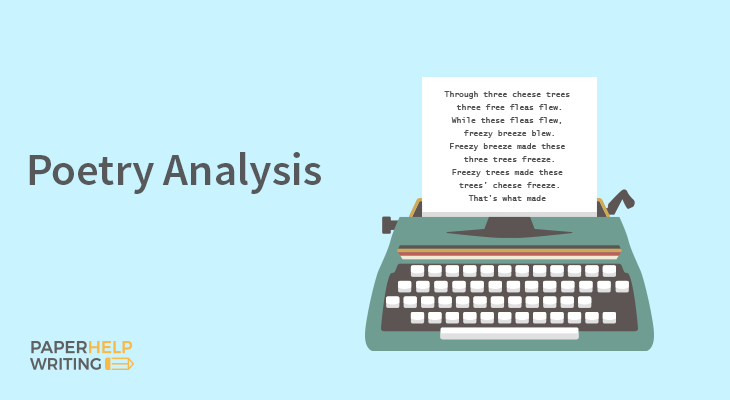 The best way to complete a perfect poem analysis essay is dealing with a familiar topic. Therefore, if you have your favorite poem, this is the best way to select a topic to analyze. Besides, when a writer has an assignment to choose between various subject areas, it is better to check the area that plays to his strengths. It will help you to prepare clear and convenient results. It is great when you have enough time to check the period when the poem was written. It is important to check background and the context to know how to prepare a perfect essay paper. The poetry analysis paper has common elements and requires standard steps to be followed. A poetry analysis essay does need to be too complex. It is enough to provide a simple outline, which will remain a simple guideline for the writer. Write down the title of the paper, provide a short outline, and then start working with other parts of the text. The outline helps to structure all the elements and focus on the most important pieces of a poetry analysis essay. This essential element allows brainstorming the main ideas for the introduction paragraphs as well. This is an important part of an essay since it includes the main thesis. Moreover, every poetry analysis essay requires an eye-catching introduction with a “hook” in it, thus make sure you can provide it. The introduction can contain some background information, interesting trivia, and other important data for an audience. It is preferable to make an introduction short and concise. This part of an essay paper requires a list of arguments provided. In the same time, every paragraph in the body part needs to be devoted to a single argument. It is important to use analysis results and evidence to support your ideas and theories. Use the outline to write down every important element of poetry analysis. In order to provide a unique and flawless paper, use transition words and phrases. This will help you to build a perfect structure of a poetry analysis essay. The conclusion is an essential part of every poetry analysis essay. The conclusion includes the summary of the thesis statements and evidence used to support a thesis. You can also include your personal observations and recommendations into the conclusions. Many writers use thought-provoking sentences to let the audience remember your findings. If you can choose poem topic, make sure to select the once you are familiar with, including your favorite poems. It is great to read a poem aloud for a few times or read it to your friends or colleagues. This is very beneficial since you can discover hidden information. Check the meaning of the words and phrases in a vocabulary since there could be multiple meanings. Besides, many words have different cultural meanings as well. Check the conclusions to reveal one main idea or theme. It is preferable to deal with clear ideas and avoid too provocative ones. This will help to show your ability to provide critical thinking results and focused opinions. Check the meaning and background of every word. The writers adore providing hidden meanings, thus they often provide hints for readers to find them. Use the ability to think critically and your analytical skills to distinguish every hidden idea and meaning. In case you do not have enough time to conduct a proper analysis, make sure to find a reliable online writing company to help you with your complex academic assignment. “Winter Solstice” by Hilda Morley is the popular poem based on the description of the winter solstice. Therefore, the writer has used a bunch of words and phrases to create a mental picture of the winter solstice. According to a dictionary, winter solstice is the shortest day and the lengthiest nigh period. Morley outlines the importance of the mentioned period for people. Since this is a solstice day, the poem (1983) reveals the need for people to face own fears, concerns, and other feelings at once. This is the exact period when a person must experience the effect of every emotion felt and choices made. The author shows that the person’s life contains more secrets that we used to reveal in ourselves. According to the author, the distance between the sun, earth and the moon is always larger than the importance of our concerns and fears. In fact, the poem remains very entertaining and informative at the same time. The author uses various technical elements to reveal own ideas and theories. The structure of the poem helps the author to outline the main meaning of the poem. The most exciting feature of the poem is its original layout and structure. The poem is written as free verse, thus it ignores all the existed rules and poetic standard. It does not have any rhyme scheme or configuration of syllables, bringing irregular and unpredictable rhythm. The poem starts with an impressive description of a scene of the auto crash and further reveals the victims of the crush. Another poem line includes the feelings of the witnesses of the car accident. The main theme of the poem is death. The author tries to reveal the nature and meaning of the immortality. He describes the car crash and compares it with other forms of death, including suicide, war, cancer, and miscarriage. The poem has a gloomy mood. The type of the poem is a lyric poem. The author does not tell a story but reveals descriptions and reflections. The images provided by the author are extremely realistic. The topic worries everyone since any person can die of a sudden. Shapiro reveals the unexpected nature of the death and the shock it brings for other people who face scenes of death. In some way, the poem reveals the inevitable nature of the death for every living creature. Writing a good poetry analysis requires a deep understanding of the analyzed poem and impressive writing skills. Good poetry analysis is often a challenge for many students. Moreover, this assignment takes a lot of your time needed for writing a draft and then preparing an entire paper. The poetry analysis is a way to show the direction of the writer’s thoughts and check a unique writing style. Every analysis must be supported by evidence and various theories. The poetry analysis has the same structure as a literary analysis essay. This analysis brings a strong need to check the choices made by the author and the consequences. The essay paper must include critical thinking elements, even if you provide multiple ideas and theories. This is quite a complex academic assignment, thus if you have no time to complete it, better order a paper online using services of reliable online writing company. If you face significant problems with your poetry analysis essay, our writers are willing to prepare this important and complex work for you. We know how to prepare a proper poetry analysis essay with excellent ideas revealed, useful results of the analysis, and practical findings.